The pretty young girl, though excited to be the center of attention, is shy during her walk toward the crowd. Depicted is the dichotomy of persistence and hesitation as evidenced by the flower which has been dropped along the way. This is a portrayal of that instant in a young girl’s life when she learns that persistence must prevail. A very important moment. The original pencil drawing was reproduced on acid free fine art paper using pigmented ink for a lifetime of beauty. 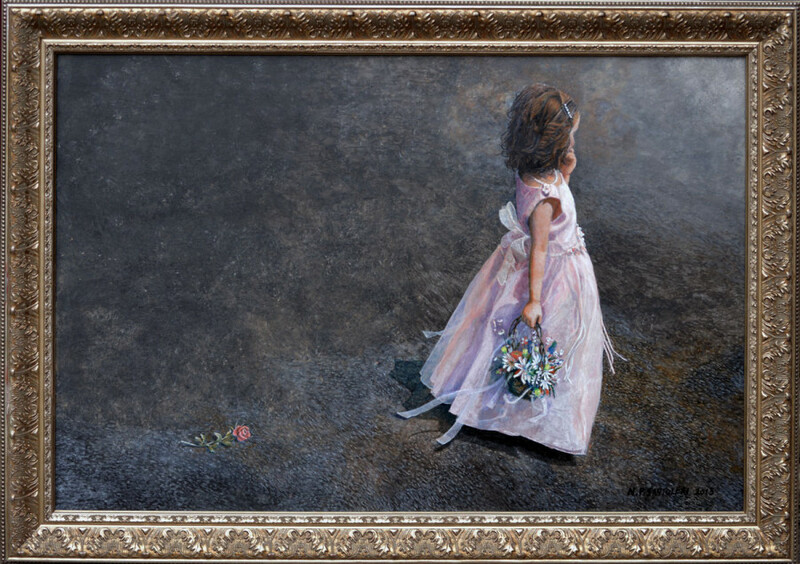 The reproduction, signed by the artist, can be matted in a standard size mat opening and therefore a standard size frame (framing information). Are you getting married soon? This would make an excellent gift, a keepsake for that special little girl. The artist will personalize this print (for free) upon request and it fits in a standard size mat and frame!! Open Edition Print from Pencil Drawing.